This is a perfect board if you want lot of IO pins, fast processing and compact size. This is a small form factor of Arduino Mega2560 and it also has onboard USB port so you can load code directly using Arduino IDE. 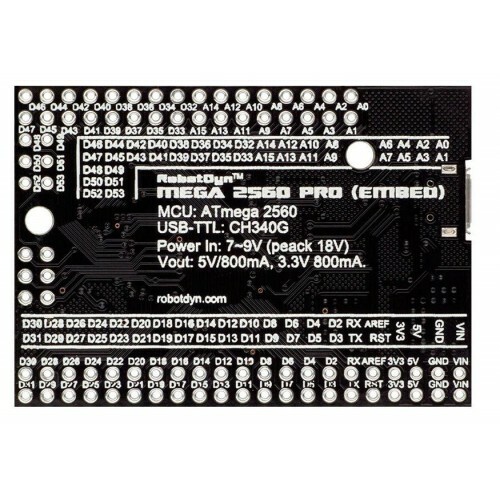 The Mega Pro Embed CH340G / ATmega2560 board is based on the ATmega2560 microcontroller and the USB-UART adapter CH340. The board is compatible with Arduino Mega 2560. The board has a compact form factor of 38 X 55 mm and is an excellent solution for developing projects based on ATmega2560. The Mega Pro Embed functionalities are identical to the Arduino Mega 2560. Even though it is an Embed board, it is solid stable as the Mega Board. It uses the original chip, and a 16 MHz high-quality quartz resonators is present on the board. 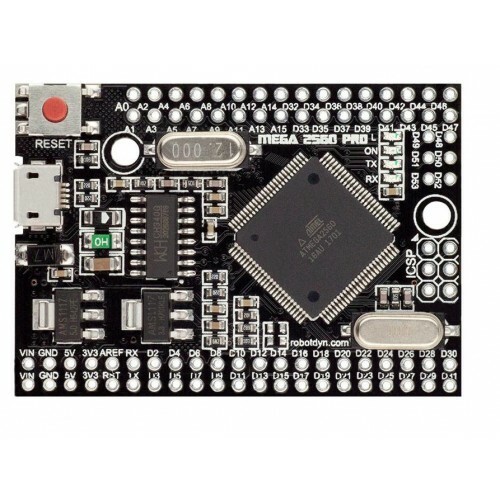 The board has a Micro USB connector that allows you to connect the microcontroller to the computer. The module has onboard ch340g IC. Download and install ch340g drivers from here. Arduino mega pro mini can be powered directly through the Micro USB connector, or via the corresponding contact on the board (Vin). The used voltage regulator operates in a range of 6 to 9 Volt DC. The maximum output current upon 5 Volt is around 800mA, while on the 3.3 Volt it is about 800 mA. The voltage regulator allows to use up to 12 volt as an input value, however we do not recommend exceeding the recommended values aforementioned, since this can lead to excessive heat and damage the device.